Mushbaby, Mushbaby, Wherefore Art Thou Scooter? It’s a day for self reflection not only because we had an exceptionally good run today, but also encountered a lot of people at the park who made O.o faces at us as we went on by them. Lots of times when we are getting ready to head out, taking a break, or have just arrived back at the car, random people will stop and chat about what we are doing. While for the most part they are curious and seem pleased there is also often a general feeling of “better you than me, sister.” And when we are actually on a run, the looks I get from people as we go on by (when we successfully go on by, that is) usually seems to be something akin to WHY OH WHY WOULD YOU DO SUCH A THING? So, why DO I do it? The elevator version of my answer is filled with fairly predictable answers: It’s good exercise, it’s fun, the dogs like it, I don’t have to fight against my dogs pulling me. Every once in awhile, though, I get a taste of something more. On weekends the state park is much busier than it is on weekdays, which is both a blessing and a curse. More people, more dogs, wildlife more active because they are stirred up by the extra activity… and more opportunities to practice things like on by amid plenty of distractions. One of the local outdoor stores occasionally hosts “How to _____ (canoe, put up a tent, kayak, build a campfire, cook over a campfire)” workshops on the weekends, which means random small groups of people here and there. Now, my dogs are not “professionals,” I don’t rely on them to make a living, survive in a harsh environment, or get the serum to Nome on time. They are pets, companions, house dogs, or whatever other term you like (except not furkids or furbabies, please) who also happen to scooter recreationally. So the feelings of my social butterflies regarding the relative values of working/ignoring distractions vs. the potential that small groups of strangers hold for lots of petting and attention are… perhaps a bit more lax and a bit less serious than a dog who actually works for a living. And “on by” is a constant work in progress. Especially on a day like today full of workshops. But it was also one of those wonderful, glorious days when everything came together. When the dogs went on by three separate workshops and two different people walking dogs with only a token effort to receive the adoration of strangers. When we had one of the most beautiful experiences I have ever had while scootering: We spooked a group of deer who ended up running through the woods perfectly parallel to the path we were on and just a bit ahead of us. The dogs were running flat out, the deer were sproinging along, and everyone was just going straight. 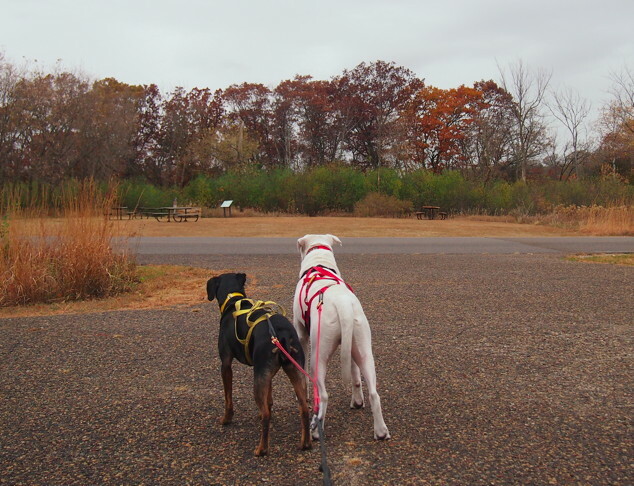 The dogs weren’t trying to get into the woods, the deer weren’t doing crazy unpredictable zig-zags across the path or deeper into the woods, and we all just… ran together for awhile while the power of my dogs and the beauty of the deer and the smell of leaves and crisp air and the joy and speed – oh god the speed – just awed me. And it went on for almost a minute until the path split and the deer followed the right fork and my dogs flawlessly followed my “haw” to take the left fork and then slowly eased up back into a nice comfortable trot. And I felt in that transcendent moment, the real reason why. The reason deep inside my heart why I scooter instead of doing any of a million other things that would exercise these dogs. Because on this day where everything came together, part of what came together was us. Us: Maisy and Squash and Me, a team all understanding each other and accomplishing things together. I had a taste of how beautiful and satisfying the partnership that comes out of all that hard work and practice can be. Me trusting them to go haw instead of veering gee after those deer and to go on by those people learning to build a campfire, and them trusting me to just let them have their fun running with those deer for awhile after all their hard work and before expecting more hard work. I could not have been happier or more proud of these amazing dogs today. Of my team. I think probably anyone who works hard with their dog(s) in their chosen sport or activity, whatever it is, has felt a moment like that. Or at least I sincerely hope so. Because when things stop being “you and you and me” and start being “us,” it means that next time, when things don’t come together quite so nicely and the $%@!# dogs do veer off the path to receive the adoration of strangers as if they have never heard the words ON BY before in their lives (and it will happen, I assure you), it’s not the end of the world. Just something we have to work on together, which is not so very bad at all. This entry was posted in Scootering, Successes. Bookmark the permalink.